For the most university and college programs, it is essential to have the results of one of the standard tests like GRE, MCAT, GMAT or LSAT, because for admission committees those test results are the most essential and decisive documents. In some situations you can have the certain testing requirements waived, exactly in such cases the waiver letters are supposed to be written. 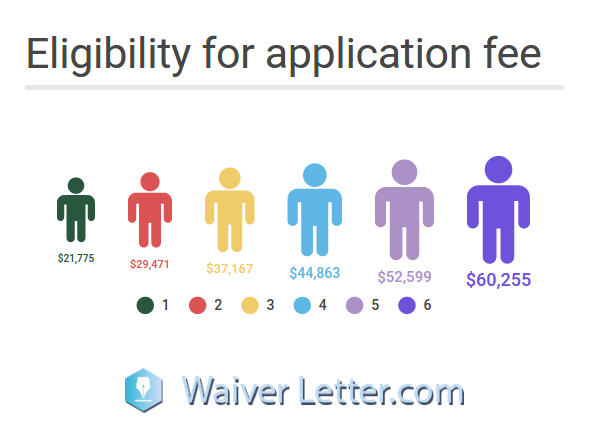 In order for your waiver letter to be written correctly, you need to check on eligibility requirements first and then if you pass, craft the one sticking to the common waiver letter format and content requirements. If you want your waiver to be done as quickly as possible and professional at the same time head to the waiver request letter specialist that can clarify everything for you on the paper with ease. Letter waiving the test requirements (or the necessity to pass the test to be accepted to the program). Letter waiving college application fees. Just like SAT and ACT, some college fee waivers enable to send the application for free. Your family income meets the Income Eligibility Guidelines defined by the set by the USDA Food and Nutrition Service. You’re on the list of the program helping students from low-income families, like Upward Bound. Your family is on the public assistance. You have no permanent home or live in the foster house. You have a supporting statement from an official of your financial eligibility. If you are planning to waive the test requirements then the results will depend on the type of test you need to waiver, what programs you’re applying for, your personal reasons provided and whether those reasons seem enough reasonable for the admission committee. When do you need GRE waiver? The grad school admission test like GRE developed to evaluate your ability for critical and analytical thinking, writing, verbal skills and reasoning. Students may waive GRE in case they have the evidence proving they already have the level of knowledge that is commonly tested by GRE test. For the waiver letter you will gonna need to keep the formal writing style and stay withing the strict official writing format, that’s why you need to include 2 a dresses for mailing. 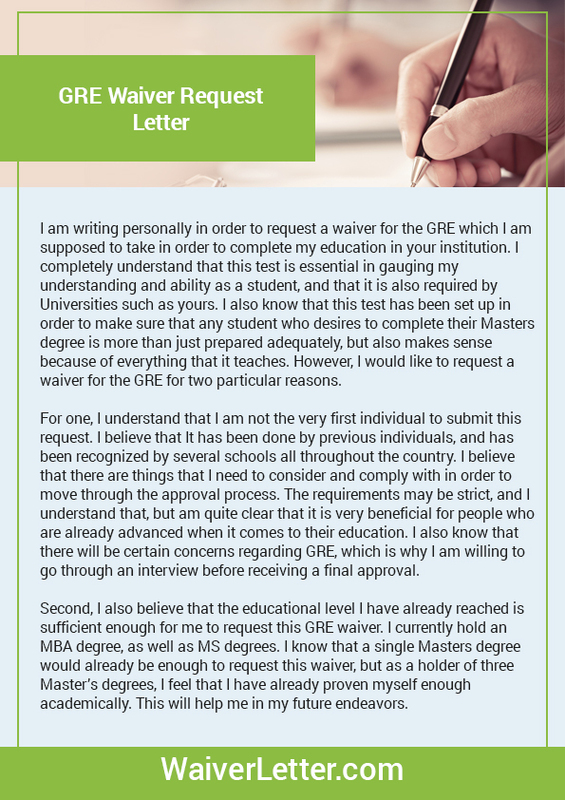 The first thing you need to know if you qualify for GRE waiver is that conditions vary depending on institution and degree program. As a rule, for the masters degree applying it is possible to waive the GRE in case your have grade close to the average, at least somewhere above 3.0. For the PhD degree applying it is possible to try waiving their GRE in cases when you’re in the process of a research conduction or obtaining the doctorate degree from any other accredited university or college. The GRE waiver requirements can be also satisfied in case when you have the documentation proving that you passed the equivalent test more than five years ago with adequate results. You don’t need to pass the GRE test if you passed the equivalent with good scores. Outline your intentions and purposes in the first paragraph, go straight from the beginning, write the concerning entry sentence mentioning the GRE waiving intention. Second and third paragraphs should be devoted to the subject matter, describe all the reasons or limitations that do not let you pass the test. Whether it’s your academic background or personal issue, try to include them all and clearly demonstrate the competencies and skills and document references that are essential for proving you shouldn’t pass the GRE. It’s even allowed to use illustrations, samples and other types of documents to prove the deal. Sum it all up and summarize in the clothing paragraph, mention your intentions once more, don’t forget to finish the sentence with gratitude and thanks, mention that you will be waiting for the response to come. When do you need GMAT waiver? Commonly used in MBA courses GMAT knowledge evaluation test (Graduate Management Admission) is used to evaluate general academic knowledge and abilities. Like the other tests GMAT is available for the online passing, however, GMAT can be a serious obstacle for some students as it can’t guarantee 100% objective results, reflecting only certain sides of abilities. GMAT waivers are fairly rare and only certain programs allow to apply for them under particular, strictly stated circumstances. 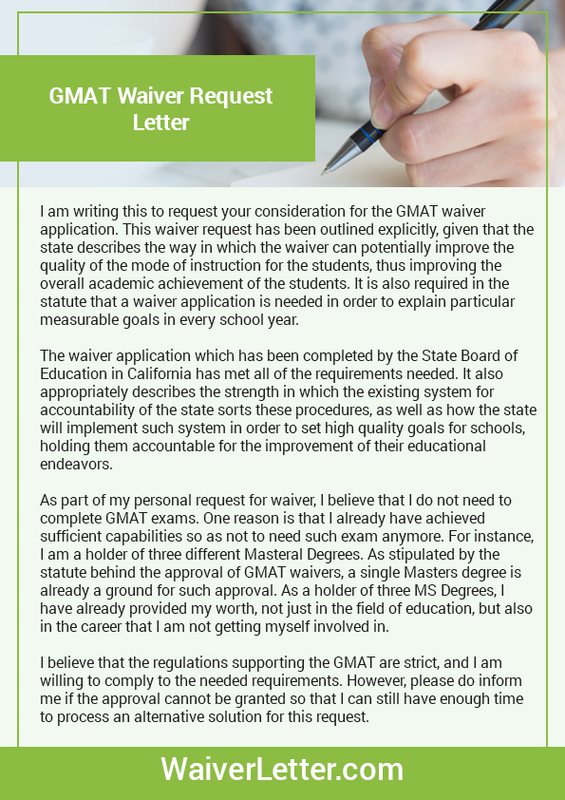 First paragraph: Stating the subject Line: GMAT Waiver Request. RE: Application to the program, including formal salutation. Second paragraph: Write why you think you’re eligible for waiving the test and what limitations make you ask for the waiver. It is important to be exact, clear and concise while providing the reasons, some students provide their relevant MBA experiences that prove they don’t need a test for skills evaluation. Restate the main idea in the short form once again. Give thanks and don’t forget to mention you are waiting for the results. Close the letter formally, “Sincerely”, “Faithfully”, etc. The clothing remarks are allowed as well. Close the letter with a signature above your full name. When do you need LSAT waiver? The most popular Law School Admission Test is a must one for the students applying for law schools within the US territory and in other countries as well. Committees will define your academic future depending on LSAT score in the most cases, however, there are some loopholes which allow waiving the test in case the real reasons are provided. 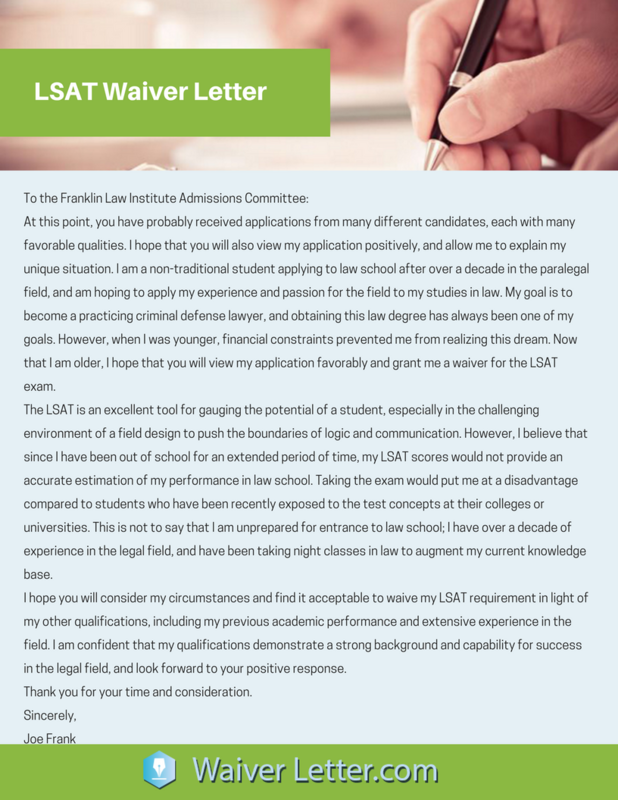 LSAT waiver letter for waiving the requirements. LSAT fee waiver letter to Law School Admission Council (LSAC) asking to cancel the LSAT fees. There is no guarantee you will be able to convince the committee and your case is serious enough to resign the test but nevertheless, you should try to provide the reasonable reasons for requesting the cancellation. State the intention in the first paragraph. Write the heading and the salutation. The writing style is like in general formal letter format. In the second paragraph list all the reasons that are supposed to give you the right to waive the test requirements or state the limitations that don’t let you do the test. If there are several reasons provide them in the form of a bullet list. Or if you have all the skills essential for the program try to find the way to demonstrate them, use documents, alternative test results or other sources. The closing paragraph must contain the outcome of all mentioned before information. Don’t forget to mention that you will be waiting for the reply irrespective of the results. 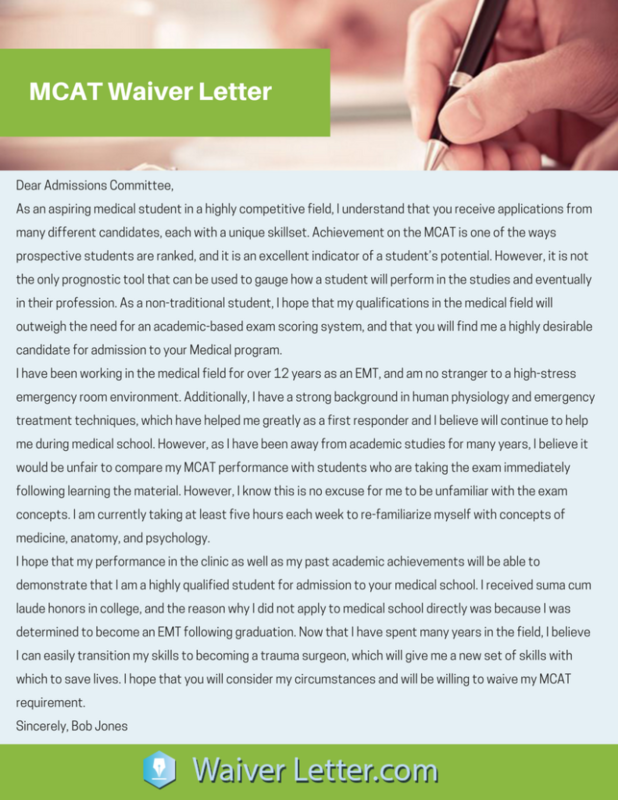 When do you need MCAT waiver? MCAT is an online medical college admission test that is aimed to define your core skills and abilities for entering a certain medical course in US, Canada and Australia. If the student believes he or she already has a level of relevant knowledge and this test is able to match those results requested by the MCAT there’s an opportunity to waive the latter in the certain cases. In the first paragraph you need to state the main concern of writing, that is mention you need to waive the MCAT test. In the letter body include the professional skills and gained academic knowledge references that can testify that you don’t need additional testing if that’s the case. When using special examples and cases you also can contribute to your professional profile, mention all the true life experiences that can show you in the better light and persuade the committee that you are a trustworthy applicant. The body of the letter will consume approximately 2 to 3 paragraph of the text, the main purpose here is to persuade the readers that your reasons are serious enough for the waiving requirements and take part in the program without having to pass the test. Finish the letter by mentioning all the information from above in the shorter form and describing the willingness to obtain the results. Finish the letter in a formal manner, providing your name and the signature. It is a common practice for the colleges and universities to use GRE, MCAT, and GMAT test scores to process the admission applications, thus each student gets the test and undergoes the standard procedure of evaluating abilities for the particular program, however, if you really have the reasonable conditions and the brains of the mastermind it won’t be a trouble for you to persuade the committee you already have all that is needed for the admission. How We Can Help with Your Waiver Letter? We keep in mind that there could be times whilst a waiver is wanted whilst making use of for faculty which is why we guarantee you’ll get satisfactory effects from us right away. Your waiver request letter is in the satisfactory fingers whilst you select to lease our writing services nowadays. With our help with MGT exam waiver, you could rest smoothly knowing that your waiver could be brought on time and within the best way viable so that your utility gets approved quickly. Personal approach: Working in such a manner ensures you best get a completely unique waiver request letter added to you. When writing, we avoid using common or replica and paste waiver letters samples however carry in a private method on your letter. Graduate diploma holders: We hire experts with masters and ph.D. Levels on your waiver request letter writing the useful resource to guarantee your fulfillment. Writing a waiver request letter of such importance for admission might be a chunk technical requiring higher knowledge and that’s why we simplest to work with the quality to put in writing your waiver request letters. High-quality results: Our expert and focussed writers offer top-notch writing and enhance all styles of waiver request letters. We have a group of dedicated waiver request letter writers with revel in various disciplines. Hand your waiver letters writing headache to us and be confident in the result!